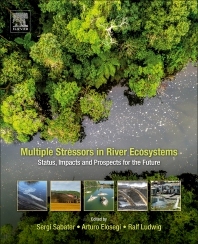 Multiple Stressors in River Ecosystems: Status, Impacts and Prospects for the Future provides a comprehensive and current overview on the topic as written by leading river scientists who discuss the relevance of co-occurring stressors for river ecosystems. River ecosystems are subject to multiple stressors that threaten their ecological status and the ecosystem services they provide. This book updates the reader’s knowledge on the response and management of river ecosystems to multi-stress situations occurring under global change. Detailing the risk for biodiversity and functioning in a case-study approach, it provides insight into methodological issues, also including the socioeconomic implications. Dr Sabater is a Professor of Ecology at the Aquatic Ecology Institute as well as the Catalan Institute for Water Research. He has co-edited numerous books in English and Spanish in addition to publishing more than 200 papers on ecology in international scientific journals. His research career has been focused on the ecology of fluvial ecosystems. His preferred lines of research are the ecology of river algae and biofilms, the ecotoxicology of biofilms, the metabolism and functioning of fluvial systems, and the effects of global change on fluvial systems, in particular those related with water scarcity and the associated effects of higher nutrient content, hydrological alterations and toxicant occurrence. Dr Elosgei is a Professor of Ecology at the University of the Basque Country. He has published more than 70 papers on ecology in international scientific journals and over 100 other contributions. He researches river ecology, with especial emphasis on the interaction between hydromorphology and ecosystem functioning, and applies his research in river restoration. Dr Ludwig is the Dean of the Faculty of Geosciences and Professor in Applied Physical Geography and Environmental Modeling at LMU’s Department of Geography. His research is focused on process-based and spatially distributed hydrological modeling at the catchment scale, data assimilation and model integration for water resources, land use and climate change impact assessment from Mediterranean to subarctic environments and feedback mechanisms at the energy-environment interface. He has been an Associate Editor for J-STARS (IEEE) and acts as an Associate Editor for Science of the Total Environment (STOTEN). He leads and co-ordinates multiple interdisciplinary research projects on the European, national and regional level, is chair of the Collaborative Program “Changes in the Hydrological Cycle” of the European Climate Research Alliance (ECRA) and Spokesperson of the Albertan-Bavarian Energy-Environment research network ABBY-Net. Fantastic! Whole process! Thank you! And material great.